I received this award some time ago, yet as time is my enemy I have only just been able to get around to accepting it. Big, huge, gigantic thanks to George at Personal Growth for the kind gesture of nominating Inner Angels & Enemies for ‘The Reader Appreciation Award’. I am truly grateful to be included in this group. Please check out George’s blog as it really deserves it’s nomination for this award. George has many wonderfully insightful posts that are a true pleasure to read. 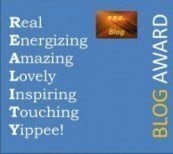 I really wanted to nominate all the blogs I have previously nominated but I couldn’t fit you all in. You have all become so important to me, for your loyalty and companionship, your constant support and encouragement. You all know who you are and if I had an award for ‘Most loyal blogging family members’ I would be handing it out to you all! Thank you for helping me gain some feedback for my writing, you are a great comfort to me and have encouraged me to keep going on the often uncertain road of a writer. I can’t begin to explain how surreal it is to be nominated for my first ever blogging award! 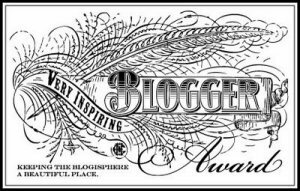 Thank-you so much to my friend in the blogosphere Tj for this wonderful honor! 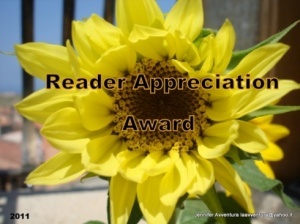 Please check out her adventures and inspiring photography in her blog Tj’sGarden. I am so new to this writing business that I am not quite sure how to process this acknowledgement. It kind of feels a bit unwarranted and I am humbled by it. I was called to write many years ago and had no idea where to start. After a few bodged attempts I have begun to find some flow and it has had a wonderful effect on my soul. I write to help spread the power of truth, faith and self-awareness, to inspire courage in those who find themselves struggling in this sometimes difficult life. I pray for everyone to reach their God given potential and fight off lies and fear at every turn. Inner Angels and Enemies is purposed to help everyone become aware of the war inside and share stories of the abundant power of God’s love that is at our fingertips, if we can only realise and reach for it. I only work part-time, being invested at home with my girls is my priority. When I sing really loud it makes me so happy inside! It calms my chaos! I have recently discovered the joy of creative cooking. I have many favourite TV shows: Parenthood and Boston Legal come to mind. I was born in the U.K. but have lived in Australia for almost 30 years. I was very hard to narrow down to only 15 bloggers, and I would love to hear from you to let me know you received your nomination. I am thrilled to be part of such an amazing group of people whom I have had the pleasure of interacting with in the blogosphere. I can see a vision of us all sitting around in the New World sharing Words, Love, Faith and Songs of Praise! Wishing you all Abundant Blessings…In His Name….